Connecticut: My, what big ears you have! 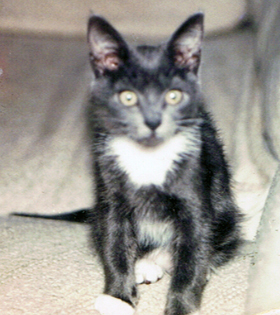 One day, oh so many years ago in Portland, I woke up from a nap to find a little grey and white kitty with huge ears on my bed. She came from a typical domestic kitty mold—thin, long-legged, steel grey fur on top, snow-white fur on the belly and chest, alternating toes, a faint white spot on her upper lip. My then-husband had been out with his sister and found her in a pet store. She was a beautiful surprise gift. We were planning to move to Connecticut (the state) for my then-husband to go to graduate school. So she became Connecticat, or later, just Connecticut. She bravely survived the drive across the country from Oregon with all of our worldly possessions in tow; tent camping in magnificent lightning storms, getting fleas in the occasional seedy pink hotel. Seeing the Grand Canyon with us for the first time, patiently waiting as we visited random tourist sites across the country—Andrew Jackson’s Hermitage, The Museum of Appalachia, The Memphis Zoo (don’t ask me why I remember all of these Tennessee sites), even waiting in the tent for us as we visited D.C. for the day (I can’t believe we left her like that). She was a sensitive soul and the trip was not without ramifications. In addition to acquiring the fleas, she got her head partway out of her collar one time and panicked as it got stuck on her teeth (we were there to extricate her, thank goodness). She also developed some urinary issues which surfaced now and then the rest of her life, as well as becoming skittish, for instance, developing a doorbell phobia which would send her straight under the bed with every visitor. We thought we were having a grand adventure with our cat. I’m not sure she agreed. But clearly we loved each other and life was good. Connecticut later survived acquiring a sister, Queequeg, and another cross-country move, this time to California. She survived the adoption of not one, but two stray cats, but made it clear that she wasn’t interested in my pet philanthropy. 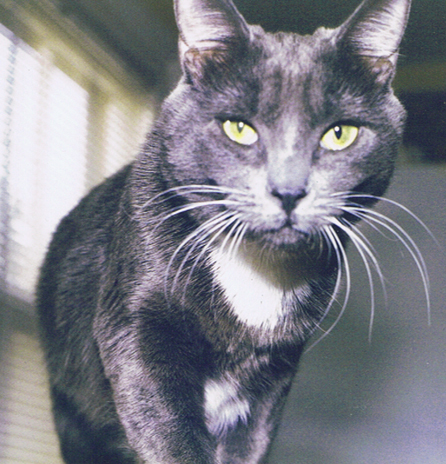 Queequeg met her untimely death there at the paws of one of the semi-strays in 2001, and my then-husband decided to leave a month later. It was just Connecticut and I for a little while, and she loved it. I was in turmoil over the loss of Queg and my marriage, and decided to adopt a kitten from the local shelter. Tundra had to be one of the sweetest cats I have ever known and she was a beautiful Siamese Lynx Point mix. Connecticut hated her. It was at that point that I realized and accepted that Connecticut just didn’t like other animals very much. She’d never been super snuggly with Queg, and I had always thought that it was Queg, who was always a little conflicted over displays of affection. Of course, then I adopted Pip in order to give Tundra somebody to love and play with (this was only semi-successful, but they did become great pals eventually, until Tundra met her untimely death at just over a year old from a strange illness). One more long car trip was in Connecticut’s future—this time from California to Oregon. Connecticut, Tundra, Pip, and I crammed into the front of my jam-packed Subaru and moved to Bend. Unfortunately, Connecticut and Tundra had both developed car sickness by this point. After we arrived, though, Connecticut seemed to mellow out. We added another companion cat, Nevermore. We moved to a new house. We lost Tundra. We lost Tamias (a little kitten, to F.I.P.). We added a human (my now hubby). We had lots of friends with their crazy dogs over. We added rescued shelter cats (Gordy & Tommy) and went through two batches of foster kittens, one of which we kept (Isis). We took in a cat on death row from the vet clinic (Big Kitty). We got a few crazy dogs of our own. Suddenly, small step-kids were everywhere, frequently. Miraculously, Connecticut quit hiding under the bed and became a sage Queen Bee. In the midst of our new chaos, she was calm. She never especially made friends with any of the other animals; she warmed up to my older step-daughter, but mostly kept her distance from the twins. Nothing fazed her anymore, and she seemed happy. A few years after we arrived in Bend, I noticed that Connecticut started looking a little rumply. She had always been a beautiful plush and shiny grey-blue. Her fur wasn’t as glossy as before, it started to look a little clumpy. She got a little skinny. We couldn’t find anything wrong at the vet, but I began to worry about her. This went on for years, but she was herself, just a little straggly. In late fall 2009, though, she began throwing up hairballs more often than usual, and became noticeably too thin. Blood work found some pancreatic issues, but nothing definitive. All we could do was try to get her to eat. And then she decided not to, most days. I watched her waste away to a skeleton after coaxing her to eat, sometimes force feeding her by syringe, for months. I was terrified to lose her—I thought she would be one of those cats who lived well past her 20th birthday. I was in denial. And I failed her. I failed her by not recognizing when she was ready to go, by hoping that a good day, a day in which she ate a little, might be a sign of improvement. I had never had to make a decision to euthanize one of my animal friends. I had lost many through tragedy, and the decisions had all been made for me. I regret that I may have let her suffer longer than she needed to. I also regret that I buried her rather than having her cremated like most of my other animal friends that have died. I’m not sure why this bothers me so much, but I was sure to cremate Deimos when he died last November and there is something comforting in having his ashes. Since losing Connecticut, I’ve had to choose (with my husband) for two companions to be euthanized (our foster cat, Big Kitty, and our greyhound, Deimos). I now know that I can make a different choice than I did with Connecticut, and that choice can also be the right choice. I’m going to feel guilty either way (did I do everything I can, did I wait long enough, did I wait too long, if I had more money would I have made different choices?) and that is my issue, not the animal’s. It took me a long time to get past Connecticut’s death last year; Her death bowled me over. I still miss her, I still think of her every time I go to bed, every time I look at a heat vent (she loved being warm and could often be found hanging out on or near heat vents), every time I take a bath (she would always come up and hang out with me at the side of the tub), every time I interact with or feed the other animals, every time I cry. But I also have come to terms with her death and the decisions I made for her (and for myself). There is no doubt that she knew I loved her fiercely and that I made the best decision for her that I could at the time. She was not stuck in a cold metal cage with a feeding tube in a strange place among sick and dying strangers. She was home, with those she loved and who loved her. That is all I had to give. Remembering my friend, Connecticut, Part 1: MELL-ow! Today I am remembering my friend, Connecticut. She left this world one year ago, February 13, 2010, at nearly 16 years of age. Most of this memorial I wrote a few weeks after she died—writing about her was a cathartic moment that helped me to push through a very dark time. Many of these photos have been on my bedside table for the last year: they are from when she was young and vibrant, because I was not very good about keeping track of or even taking photos in the intervening years. Every day I wake to Connecticut’s penetrating gaze and smile. She loved me like no other. It seems that I’m going to have to write about this, or lose my mind. And body. The body is the mind is the body is the mind—that much is becoming clear, even as everything else is becoming less. My grief for Connecticut is a palpable thing. A very real thing, a physical thing, a physical presence, a weight, a darkness. I can feel it in my forehead, the back of my neck, and of course, my lungs. There are people who care, who understand, and through my fog I have received their small offerings of comfort and wisdom with real appreciation, but little understanding of how to really make sense of it all. I got to talk with Steve [my vet] today for a little bit, for the first time since she died. It was evident that I was really down, and sick, and he said, “Is it, you know, a lung thing?” circling his fingers around his lung area, “Your sickness?” I indicated yes. “Well,” he said, “In Eastern medicine grief is indicated in the lungs.” And I was glad to hear it, because I didn’t know that, but I do know grief has made me sick in both mind and body, and it is good to feel validated, again, even though it does not make me feel better. We also talked a little about how the seasons affect us and the animals, about this time of year. I mentioned how I felt guilty—that maybe there had been more we could have done for Connecticut. I think he was sincere when he said that no, there really wasn’t anything else that would have helped. He said there was another cat with similar symptoms around the same time, and he ended up “sending her to kitty heaven” a few days ago. At least we can speak candidly with each other of these things. So likewise, a few days ago I saw the nurse practitioner because I felt like I have strep among some other nasty things. I told her right away what had happened, and she also agreed that my grief had made me ill. She reminded me that in this society we are not given a chance to grieve our animals, let alone much time to grieve our humans. That first day when I stayed home to be with Connecticut when she was dying, I said I was sick. Soon, I really was. Thinking makes it so, and sick is an acceptable excuse to stay home—grief is not. She mentioned that animals have a way of teaching us—and maybe there was a reason she died so close to mom’s death anniversary. That has not made it easier. Connecticut, Connector, Connection, Nectar, Nectarine, Rumply, Cow Kitty, Bat Ears, Long One (this from a comment made by a vet when she a kitten, “My, that’s a long one,” he said, measuring her torso). She died in my arms on February 13 at around 5p—just under two weeks ago. Mom died February 16, 19 years ago. Grief never really leaves, it gets weaker over time, maybe, like a virus, but is there lurking, waiting to pop out again angry and raw at the first opportunity. I’m so afraid that I’m going to forget what Connecticut was like. Everything always fades. I can’t really remember anything specific about 20 years with mom; what her voice sounded like, what we talked about, even what she looked like—other than in photos and videos. Sure, I remember impressions, snippets of conversations, a laugh, a glint in the eye, bits of conversations and stories told. But much of it disappeared a long time ago. I just don’t have a great memory for detail. I walk around this house and there is a palpable absence of Connecticut everywhere. Nearly 16 years of her are walking around with me. I wish I understood where she is now—my oldest friend. I thought going through the process with her—not hospitalizing her, letting her go when she needed to go—I thought that would help us through it too, my husband and I. But holding her, feeling her take those last long breaths, so far apart, feeling all of the heat drain from her body, her feet so cold to the touch in those last few minutes—it didn’t help. She was there, and then she was not there. Where did she go? If she were here now, she would be stoically helping me through this by curling up in my lap or on my chest at every opportunity. That had to have been one of her most favorite things in the world—doing “the boat” or becoming “a loaf” on my chest, purring away with that deep, sputtering, popcorn of a purr. Another nickname: Popcorn Head. If she was in the mood, and she often was, she’d undo the boat and strike a sphinx pose, with her arms very close to my face, so she could poke me now and then with her paw. And then, waiting for me to become sleepy, or sometimes after I was asleep, she’d lick my face, which I would try somewhat unsuccessfully to dodge under the covers. She obviously thought this was funny. And it was a game we had played hundreds of times. Connection was my cat, who became our cat. She seemed to have loved my husband and I both equally, and without judgment, which is something we are unable to do even for each other. She was a constant, for so many years. When she was younger, she used to be very sensitive to my tears, and would stick her beak in my face, trying to comfort me. After a while, she stopped doing that, probably jaded by too many tears. But I knew she still cared, because she was always there to jump in my lap, no matter what kind of mood I was in. And for more years than I can remember, after a preliminary boat session on my chest, she slept most of the night to the right of my head and pillow, between me and the night stand. That was her spot. Occasionally, for variety, she’d sleep in the middle between us. Sixteen years is a long time. That’s four and a half years short of the time I had with my mom. That’s longer than any other friendship I’ve had. I will miss Nectar always. I hardly know what to do with myself. For the first time in two months, I got up today not having a daily writing or blogging challenge to fulfill. 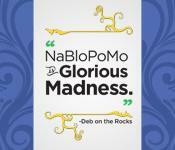 In November, I participated in NaNoWriMo and NaBloPoMo. As November was drawing to a close, I discovered #reverb10, so I chose it for December. All of these challenges kept me motivated daily, were a great way to kickstart my writing habit again, and were a great inspiration for self-reflection. 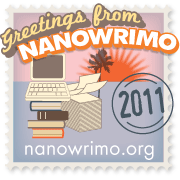 Now I’m sort of hooked, so I was on the lookout for a writing challenge for January. Instead, I found #mindful52: Year of Mindfulness * 52 Weeks of FOCUS. This challenge is with a much smaller group of people and will concentrate on both journaling and blogging around a weekly thought*concept*practice. Focus is exactly what I need this year, and I’m excited about having a continual reminder to work on my mindfulness. I think I’ll still try to blog every day, however I’ll also make sure that I’m writing outside of the blog as well. This week, #mindful52 encourages us to work with the concept of new beginnings occurring all the time. As you remain hopeful contemplating the year ahead – make lists and think about what you’d like to achieve. I’ve never been one for New Year’s resolutions, since I’m naturally adverse to anything that seems cheesy, false, or forced. Normally, I’m resistant to structure and discipline and in favor of winging it and spontaneity. But something is different this year. I’ve begun to realize that some things are never going to change if I don’t make some goals and structure my life so that I’m making daily progress towards small, achievable things. I have outlined some general goals on this blog over the last month and have privately been crafting and sketching out some more. Here’s my progress so far. As I outlined in an earlier blogpost prompted by #reverb10, I made a short list of my most important daily commitments (one of the suggestions in The Power of Less, see below). What do I do each day that doesn’t contribute to one of the above — and can I eliminate it? Be 15 minutes early for everything for an entire month. This means leaving 1/2 hour early to anything around town. Go to bed by 10 p.m., get up by 6:30 a.m. every weekday for a month. No more late night blogging. This one is a big challenge for me. I’m naturally a night owl and for the most part I make my own consulting schedule. Additionally, I hit my stride mid-afternoon and on into the evening as far as productivity goes. Also, I have a really hard time getting up in the dark during the winter. And yet, there are certain advantages to conforming to a “normal” workday schedule. Also, I’d like to exercise and write on a regular basis before other distractions and commitments take hold, and since these are on my short list, I need to make them a priority. I’m curious to see if I can stick with this for a month. At that point, if I feel that my productivity has taken a hit, I will reconsider. Part of me is really rebelling against this because of all the self-righteous “morning people” who have created this cultural myth that you’re a bad person if you’re not an early riser. But it’s not like I’m trying to get up at 4:30 a.m or anything crazy like that, so it should be doable. Write every day for ½ hour, not including blogging. Blog early in the day. Not sure how this is going to fit in yet. Start over with Flylady’s baby steps to keep my house clean and decluttered. Learn to tell better stories—out loud and through my writing. Write a story worthy of Fantasy & Science Fiction magazine. Learn to make people laugh (besides myself). Laugh more daily. Things that make me laugh out loud: Bizarro & Awkward Family Photos. Go birding & hiking again (miss this). Expand my front yard gardening knowledge. Grow my career in a creative and satisfying way. Interview some people who intimidate me. Take more photos: of myself (because there are very few), and of my hubby and animal family (because the days are short). Open myself up to making new friends. Maintain current friendships. Plan and take a road trip with my husband. Start a regular yoga practice again. Mental clutter—write more, multitask less. Things clutter—keep purging, keep flying. Fear & worry—write daily, keep choosing to do new scary things, express and explore through writing and art. Indecision—write, and hope that things become clear. Guilt—don’t set myself up for it. Stress—create structure, leave more time between appointments. Envy & jealousy—working on 3-6 will help. Grief—impossible to eliminate, but here’s hoping for a year without more loss— if grief, then write. Pneumonia and/or bronchitis—closely tied to grief: express myself through writing, keep fit, do yoga, meditate, get acupuncture. Cynicism (but keep critical thinking). Negative people—avoid when possible, counteract with compassion. Money issues—closely manage, but let go of 3, 5, 6, & 7. I’d like to have one month where I create something every day (not writing and preferably not on the computer). This could be part of learning to draw or paint or craft, or to pick up mosaics again, etc. If anybody knows of a group of people who are doing this as a challenge, let me know. February will be my Light Box month. It’s typically a hard month for me because it’s the month my mom died, and as of 2010, the month my old friend Connecticut died. Usually, I let it sneak up on me and end up getting physically ill. This year I’m determined to face it head on by reading, writing, and blogging about grief, illness, and mortality. That’s about it for my lists; a work in progress. Please let me know if you have ideas and suggestions for helping me to focus. After The Year of Let’er Rip, What’s Next? I’m a little self-reflected out. Good thing it’s the last day of reverb10. Happy New Year (thank the gods). I’ve been putting off answering this prompt all day. Haven’t I already responded to this question multiple times in slightly different ways all month? It occurs to me that I’ve been rehashing loss ad naseum over the last two months; a series of losses that has defined 2010 for me. Losing Connecticut, Big Kitty, and Deimos has taught me I can’t deny death, and that I’m not really in control. That life can be snatched away on a whim, no matter how much love or time you have invested. You would think I would have already learned this. From the death of my mom, 20+ years ago. From the death of significant relationships. From losing my step-kids. From the death of several cat friends, nearly 10 years ago. 2010 has ripped one big aching hole in my heart with a jagged rusty knife. The good in this: Is there good in this? I’d like to think there is. I’d like to think that it has made me stronger, has made me more resilient. I’d like to think that feeling this way opens me up to others who are feeling the same way. I remember after my mom died: I was 20 years old, walking around in amazement, suddenly acutely aware that there were others whose worlds had just been completely upended. It was beautiful, in a way. Every moment titrated down to a drop of concentrated feeling. Ordinarily, we travel through our days, eyes clouded by cataracts, blinding us to the bright pain of our friends, neighbors, coworkers, animals. Grief neatly excises the cloudiness. Sure, we’re momentarily blinded by shock, but soon we begin to stagger around, arms outstretched, and as we’re recovering, eyes adjusting, we begin to see that we’re not alone, far from it. So there it is. If grief makes me more empathetic to my fellow humans, and to my fellow non-human animals, then that’s something, if only until I forget, again.